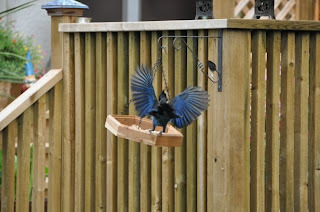 The Steller Jay may not be a popular bird to some but to me it is one of nature's simple beauties and it just happends to be the provincial bird of British Columbia, the province I live in. 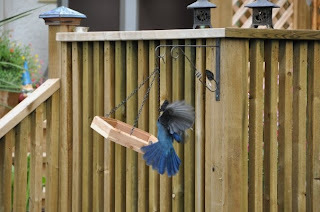 Early this spring I noticed that the jays were not coming to the yard as they had in past years so I decided I was going to attract them back. I headed off to the local Walmart and purchased a nice cedar tray to hang out with shelled peanuts. Within the day, I was pleased to see my efforts paid off. 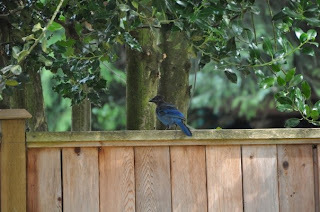 They were lining up along the deck railing patiently awaiting their turn. 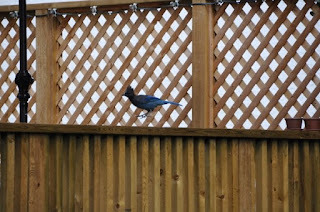 Some of the jays entertaining me like the one pictured below as he does his David Blaine impersonation. While other amuse me with their fabulous wing shows. 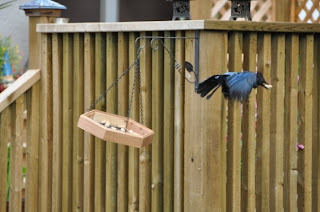 I have been noticing though, that I must be spoiling these beautiful blue birds as they are looking rather chubby now. 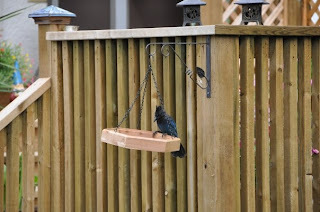 They will sit and sqawk at me through the window when the tray is empty and every morning I am out there in my jammies making sure they get what they have come to visit me for....PEANUTS!! Once they have had their fill, they are off and soon to return at the first rumbling of their bellies!